While online banking is becoming more and more the norm, many financial institutions still send paper statements that are chock full of sensitive information. If left laying around, or thrown away in the regular trash, this type of paperwork can fall into the wrong hands. So your best bet it to review them, take down any facts you need for taxes and shred as soon as possible. Believe it or not, even these small slips of paper can lead a thief to your personal information—remember that hackers and other unscrupulous characters are well-versed in cracking codes, extracting account numbers and gleaning other information. Another document that seems innocent enough, boarding passes, contain QR codes that are a gateway to several identifying factors, including your frequent flyer account number, your itinerary and more. Hackers are skilled at decoding this type of data and can gain access easily if they obtain it. Most of us know that canceled and voided checks can be altered and forged, therefore posing a risk to your identity and your bank account. But often folks keep them as back up to their taxes or to keep records of large personal or business purchases. Your best bet is to make a digital copy and shred them or to store those you need for the future in a locked safe. But remember, as soon as these documents are no longer necessary, always shred rather than throwing them away—even if you’ve crossed out account numbers and marked them void. Flyers, postcards, pre-approved credit card and loan applications are always annoying, and it’s not at all uncommon for people to just throw them away in their trash. But these mailings are an invitation to crooks who are just waiting for the opportunity to sign up for a credit card on your behalf or accept that courtesy check for a loan. Although expired passports make great travel mementos, it’s easy to understand how dangerous it could be if they were lost or stolen. If you must keep them, it’s best to put them in a safety deposit box or a safe if your home. The ideal option is to make a digital copy of all your stamps and then shred your expired passport after you’ve received your new one. 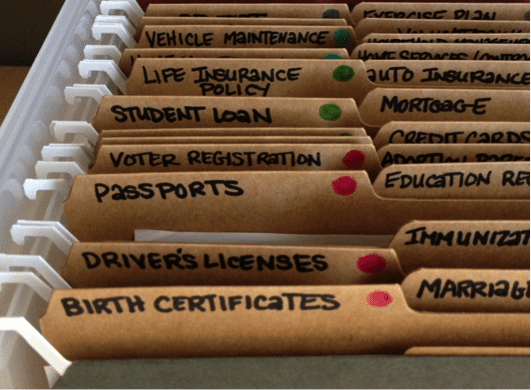 It’s tempting to hold onto many of these everyday documents, but the fact is, doing so could increase your chances of a breach of your personal information. As identity theft and other related crimes continue to rise, it’s advisable to be cognizant of what crooks are looking for and to protect yourself by shredding any papers that could be valuable to them. All Points Mobile Shredding offers onsite residential and commercial shredding services, a convenient and reliable way to permanently destroy documents. Give us a call at 772.283.4152 or fill out our online quote request to find out more. ← Tax Returns: Save or Shred?